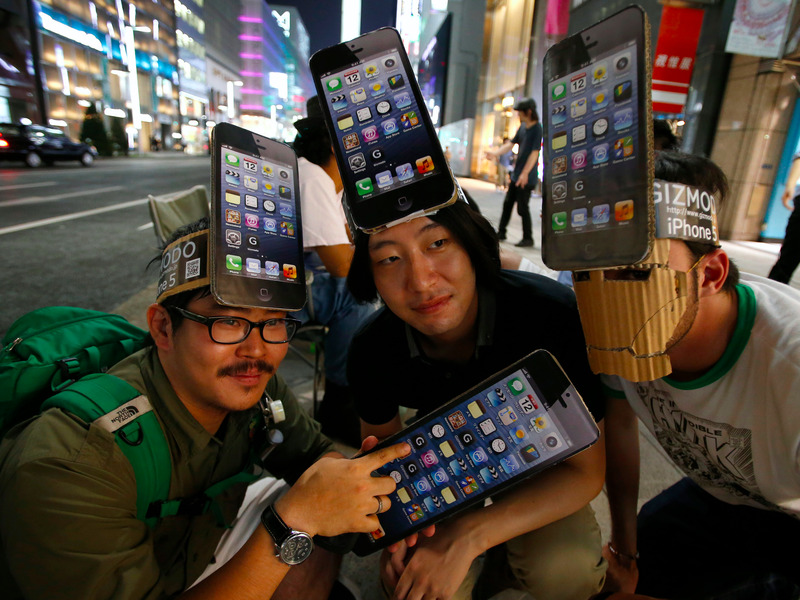 Men wearing cardboard hats, depicting Apple's new iPhone 5, pose for photos as they wait for the release of the phone near Apple Store Ginza in Tokyo September 20, 2012. Adobe announced Tuesday it is launching a "cross-device co-op" that will offer marketers a better view of who their customers are as they switch from their laptops to their mobiles and over to their tablets. One of the major advantages Google and Facebook have over other companies in the digital advertising and marketing space is their ability for cross-device tracking, thanks to those companies' huge audience of logged-in users. Many other companies — particularly ones like Adobe that don't have popular consumer products — have to rely on dropping cookies, IP addresses, and using probabilistic (rather than deterministic) methods to make sure they are targeting ads to the right people. For example, someone that researched a flight on their tablet but booked it on their desktop doesn't want to keep being targeted with ads from that airline when they switch back to their tablet — but they often are. It's annoying and the kind of practice that drives people to downloading ad blockers. There's also the issue of counting the same user twice when it comes to measurement as they switch across different devices. In the last 30 days on Adobe.com for example, the company says it received 350 million visits, but that translated to an estimated 210 million people. Adobe wants to solve this problem for its Marketing Cloud customers with a "co-operative" that it expects will link up to 1.2 billion different devices. Business Insider got a look at Adobe's presentation of the scheme ahead of its launch at the Adobe Summit on Tuesday. Marketers will give Adobe access to "cryptographically hashed login IDs and HTTP header," which it says will fully-hide a consumer's personal identity. Adobe sorts this data into clusters to build out a graph of device links. 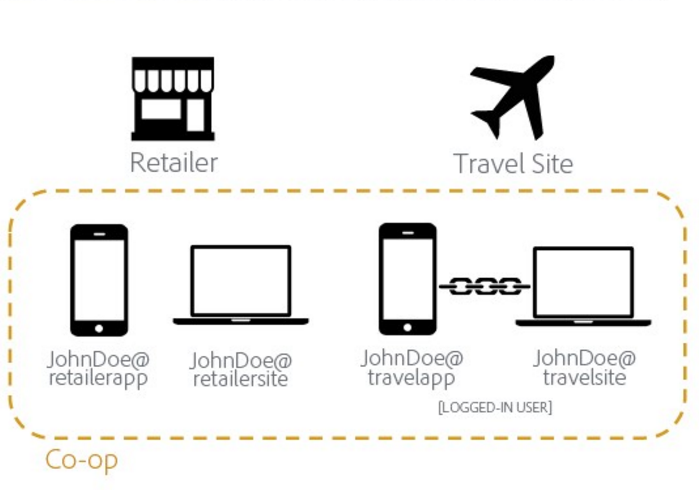 A retailer that sees a user that isn't logged in, who visits their site on both desktop and mobile, could use device information from a travel site in the co-operative — which does has the logged-in data — to link those two devices together to one person. In return, that airline will also get similar data back from other participants in the scheme. Asa Whillock, principal product manager for the Adobe Marketing Cloud, explained the scheme is fair for brands big and small because it only gives them information about the devices they have seen, not new customers. Whillock added that the benefit of the co-op versus existing cross-device products from Facebook and Google is that it avoids their "walled gardens," which he said can often "drive lock-in" for a marketer when it comes to using their other advertising products. 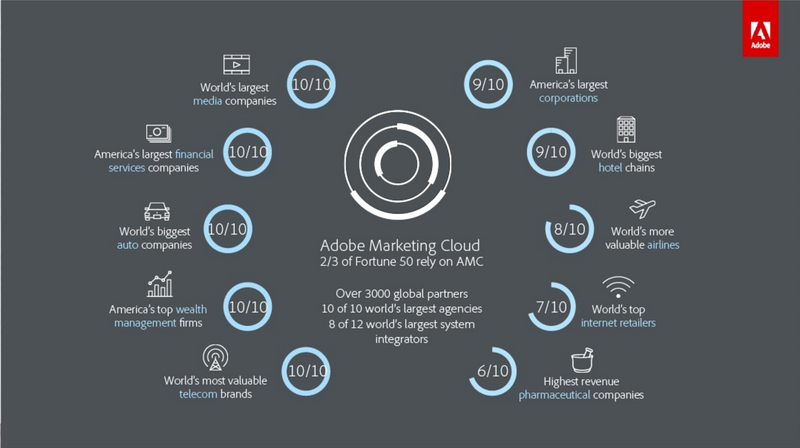 The Adobe Marketing Cloud has lots of big customers. Adobe worked with the Future of Privacy Forum to create the co-op and only device links are shared — not data like a person's email address and phone number. Currently there are no further details on where this data is stored, but Adobe confirmed there will be no personal or site visit data shared between co-op members. All co-op members are required to link to an Adobe-created centralized privacy tool to allow users to opt-out their devices. However, as AdExchanger pointed out when it reported on the co-operative's early stage testing last year, because the opt-out will require a cookie to remember the user is opting out, it's unclear how Adobe will keep this assurance if a user clears their cookies. It's the same problem that plagues other opt-out schemes like TRUSTe. The co-operative is rolling out first in North America, so there's also no word yet on how the new EU-US data transfer scheme, Privacy Shield, will apply. Privacy Shield replaces the former Safe Harbor framework and was created to ensure the personal information of EU citizens is protected when it is transferred to the US.